For Amy Ferrell of Warner Robins, the theatre program at what is now Middle Georgia State University was a lifesaver. For other productions, Ferrell was assistant director, stage manager or props coordinator. "It was like I found my tribe," said Ferrell, now 39, who went on to a career in tech support and is now finishing up her bachelor's degree in IT from Middle Georgia State. "The theatre program gave me a close-knit group of friends I could lean on. In some ways, it saved my life. To this day, Sydney is one of my most favorite people on the planet." “Sydney” is Sydney Chalfa, founder of the Impromptu Players and, for a decade or so, one of the region’s most prolific live theatre directors. Between 1990 and the early 2000s, Chalfa directed some 70 plays for the University’s theatre program. Hundreds of students appeared in her productions, along with dozens of community members who were cast in various roles. You could always spot “the theatre kids” on the Macon Campus. They really were a tribe, hanging out at all hours of the day or night in and around the lobby of the Arts Complex Theatre. Late evenings and early mornings – post performance - would find many of them at Denny’s or Shoney’s, or even at Chalfa’s home in northwest Macon. Chalfa retires this spring as associate professor of Theatre after more than a quarter of a century at Middle Georgia State. Although the heyday of her University play directing passed by some years ago, Chalfa wanted to bring her Impromptu Players tribe together one last time. 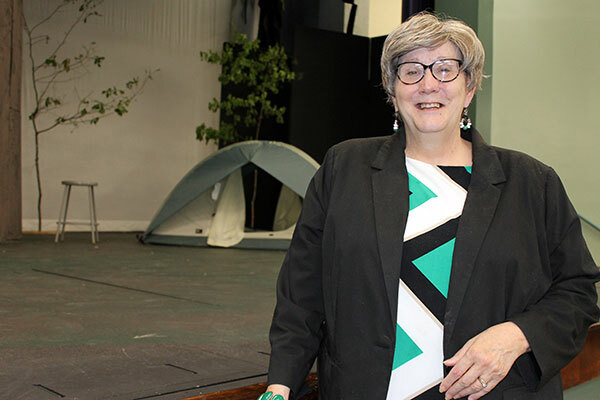 Assisted by some of those former players, including Ferrell, she organized an April 23 reunion that drew five dozen people who had been a part of the theatre program at one time or another. Some came from as far away as Los Angeles, Chicago and New York. Intense interest in the reunion did not surprise Chalfa. Mitchell Brinkley of Macon appeared in several Chalfa-directed plays, including “Cobb,” “Angels in America” and “Rocky Horror Show.” He also helped organize the reunion. Chalfa, who plans to do some playwriting in her retirement and dote on a granddaughter due in July, said she hopes she is remembered at MGA as someone who “pushed the envelope in my productions and classes. To see photos and more comments about the reunion, visit the event’s Facebook page: Middle Georgia State University Theatre Homecoming.